Our planet is experiencing climate change unprecedented in the last three million years. These changes will have broad effects on our world – like sea level change and drowning of coasts (where most people live today), shifts in agriculture with some areas potentially becoming non-arable, and modifications in the distributions of biota (plants and animals) with the distinct possibility of extinctions. To understand how these changes might affect the biota, scientists are using the fossil record to see how previous periods of warming altered the biotic landscape. These studies will not serve as a crystal ball for the future but they will help us understand the processes involved in these changes. 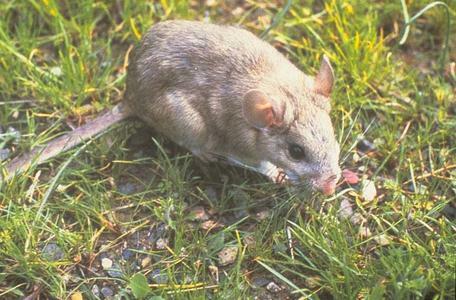 Photo of Neotoma cinerea, the North American woodrat. To this end, the Neotoma Paleoecological Database (https://www.neotomadb.org/) has been created. It contains data on fossil sites in North America and beyond. These data include the location of the sites, their geologic ages, the animals and plants that have been found at the site, and other pertinent information that can be used to assess the relevance of each site. The database is composed of a series of databases on different organisms (plants, beetles, mammals, fish, birds, etc.) and their different proxies (e.g., plants have both pollen and plant macrofossils – leaves, fruits, etc.). In this series of exercises, we will focus on mammals but other exercises can be devised by instructors or students for the other organisms by using the mammal "template." The strength of the Neotoma Paleoecological Database is that it allows an investigator to compare the responses of different organisms to the same environmental change. In other words, it is possible to do paleo-ecosystem analyses. Also, the database is relational so a series of variables can be analyzed at the same time. The modules have been designed to provide a logical progression through a variety of topics (climate, the fossil record and potential biases, paleoecology and biogeography). All of these then culminate in exercises that look at past response of organisms to climate change and then apply this knowledge to potential future changes. Students can progress through the sequential series, especially if they are not familiar with the topics, or they can skip modules with which they are familiar. Each module can standalone but they are also integrated. teaching students how to substantiate arguments (answers) with maps, graphs, and written statements. The Neotoma Explorer will be the dominant search engine that you will use for these exercises. When conducting new searches, be sure to cancel previous search criteria. It is easy forget a previously set criteria and conduct searches on unintended criteria. When examining dates for a deposit, be sure to expand the Analysis Unit column to view the age range. A date range is often given, but the younger age is not visible until you expand the column. You expand the column like you would in Excel by moving your cursor over the line dividing the columns (in the data part of the table) until a the expand icon (vertical line with arrows on either side), clicking and dragging the icon. In selecting ages to examine for change, the ranges can be set at any value in the Age Range Box. However, for most of these exercises, it will probably be preferable if the students used the following ranges as they relate to the basic climate events in North America over the last 20,000 years. All ages in the mammal database of Neotoma are expressed as radiocarbon years. For these exercises, this fact will not be significant. However, for research purposes, scientists would more than likely convert the dates to Calendar Years using a conversion program like OxCal. Taxon is the name of the animal or plant you wish to investigate. It is important to use the binomial Latin scientific name (e,g, Neotoma cinerea) rather than the vernacular or common name (e.g., bushy tailed woodrat). The scientific names are given in all of the exercises. When you begin to type a name in to "Taxon" a drop down table will appear and you then select the taxon you want. You can map the taxon for multiple time periods using different symbols or colors for the time intervals. It is also possible to map different taxa at the same time. By clicking on the red polygon or the white polygon at the top of the page you can select either the modern distribution of the species or the glacial boundary at different times, respectively. These features help students see how the distribution has changed through time and what the relationship was with the position of the Laurentide Ice Sheet. Module 1 is a scenario about ecological change that a young person observes while fishing along a creek. It is a basic introduction to ecology and paleoecology. There are several questions that make the participant think about the observations that are made. Ecological principles like the niche concept, competitive exclusion and geographic distributions of species are discussed and then related to paleoecology. Exercises reinforce the primary principles by practical exercises using the Neotoma Paleoecological Database. The concept of non-analogue biotas is introduced. This module links the relationship between the geographic patterns of climate variables, primarily, temperature and moisture and the geographic distributions of biota, including biomes. Exercises involve graphing environmental changes along various environmental gradients in North America. This module will prepare participants for understanding the basics of climate and geographic distribution. Climate change throughout the Pleistocene, the last 2-3 million years, is documented by oxygen isotope records preserved in the deep sea or large ice sheets like those of Greenland and Antarctica. Exercises use these records to determine the nature of climate at various times throughout the Pleistocene. The module provides the basic understanding of an climate record independent of changes in mammal distributions but this independent record can be used to interpret changes in mammal distributions in the past. This module looks at modern changes in the distribution of mammals and how they relate to current climate change. It provides a foundation for understanding how mammal ranges track climate change. There are excellent references to web pages and journal articles. Module 6: Modern (Living) Animals – What Do the Habitat Preferences and Geographic Distribution of Modern Animals Tell Us about Why Animals Live Where They Do? Concepts introduced in the previous modules are brought together to explain the interactions of climate change and geographic range shifts of species. These exercises have focused on climate as a driver for range shifts in species but this exercise also relates back to the niche concept and makes participants think about other environmental variables and their interactions in driving geographic shifts in species. This section also has supplementary data on the modern ecology of various mammal species and participants use these data to interpret past shifts in geographic ranges. Module 7 is an extension of Module 6 but it incorporates the past changes in climate and the distribution of mammals and has participants use these data to infer what might happen to selected species with future climate change.